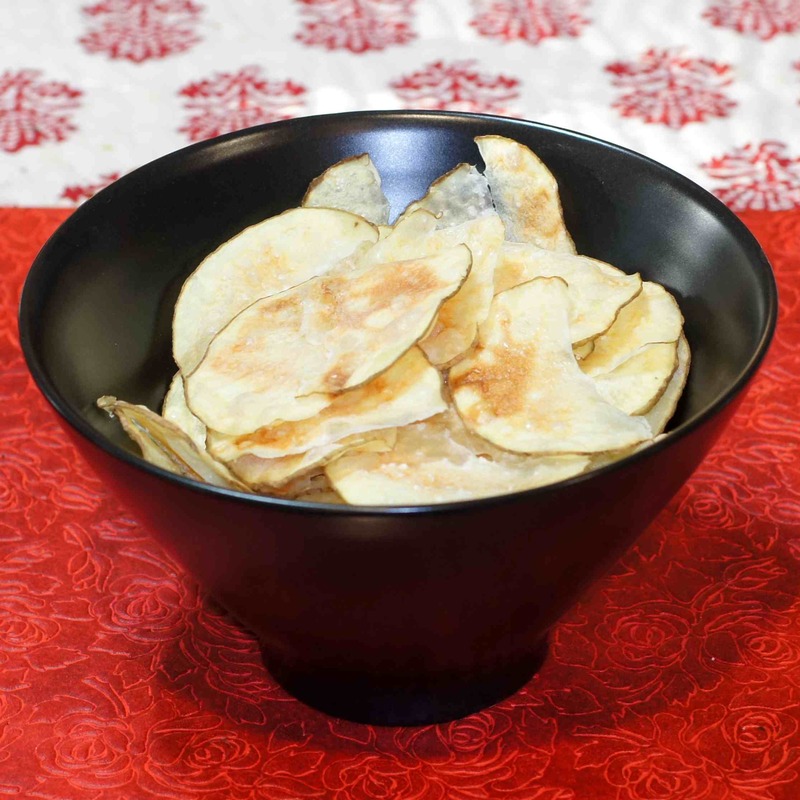 Quick, Easy and Tasty Fat Free Potato Chips?????? I guess today is a 2fer day. I have a fabulous appetizer to share with you today but before I do I need to share this amazing trick. Good fat free potato chips. Never in my wildest dreams would I ever put “good” with “fat free potato chips.” Live and learn. If I’m late to the party, then you will just have to forgive me but these really are good and soooo simple to make. Baby Lady and I cook very differently. What grabs our attention is also quite different. Baby Lady loves using a slow cooker. Me, I braise things on top of the stove or in the oven. Baby Lady is always looking for “cute” things. Me, I’m always looking at intriguing technique. She uses the microwave to cook certain things. Me, with limited exception, I believe a microwave is only for reheating certain foods and could generally live without it. The list of differences can and does go on and on. 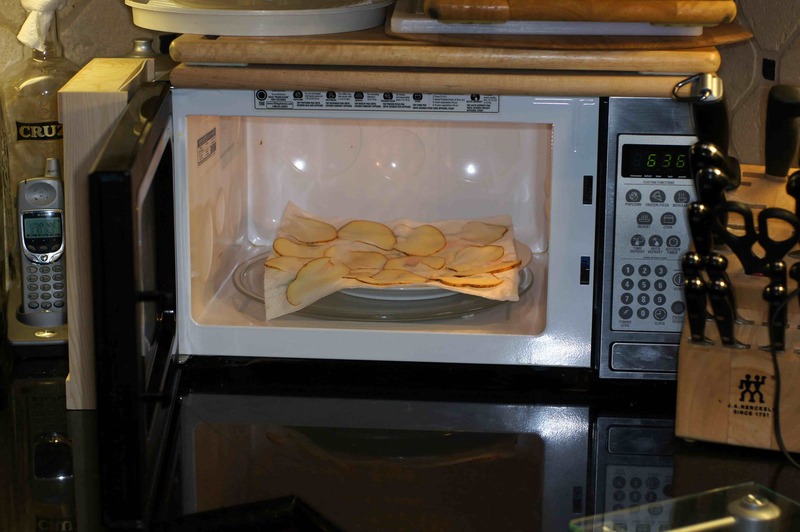 So it wasn’t much of a surprise when one day she said she wanted to make microwave potato chips. I said “What?” She said “microwave potato chips.” I said “No way.” She said “way, microwaving the potato slices dehydrates them. They’re supposed to be good.” I said “This I gotta see.” So, she showed me. Inasmuch as we had been wanting to make this appetizer for a while we knew what we were going to do if the chips turned out to be good. They did and I was blown away. Fat free, low calorie, crispy, crunchy potato chips. Now, I can have potato chips and not worry about my diet. If you have never tried this you need to. So, without any further ado, this is what Baby Lady did. 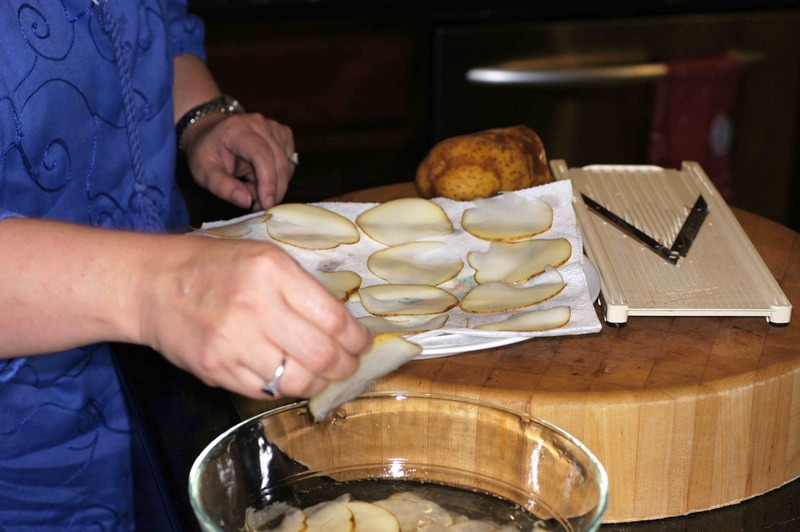 Using a mandoline, slice the potato very thinly, roughly 1/8 inch thick. 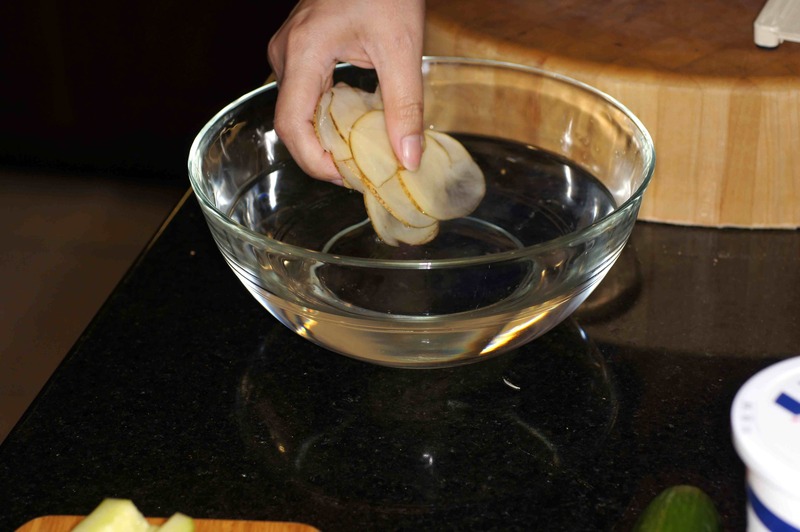 Put the potato slices in a bowl of water to remove excess starch and keep them from oxidizing. Take slices and lay them out on a plate lined with a paper towel. Now, place the plate in the microwave for 7 minutes on high. I’m still blown away by these tasty, fat free, crunchy treats! Wha…? I gotta try this. I use my microwave as a kitchen timer! Maybe not any more…..
Bless you, Baby Lady! 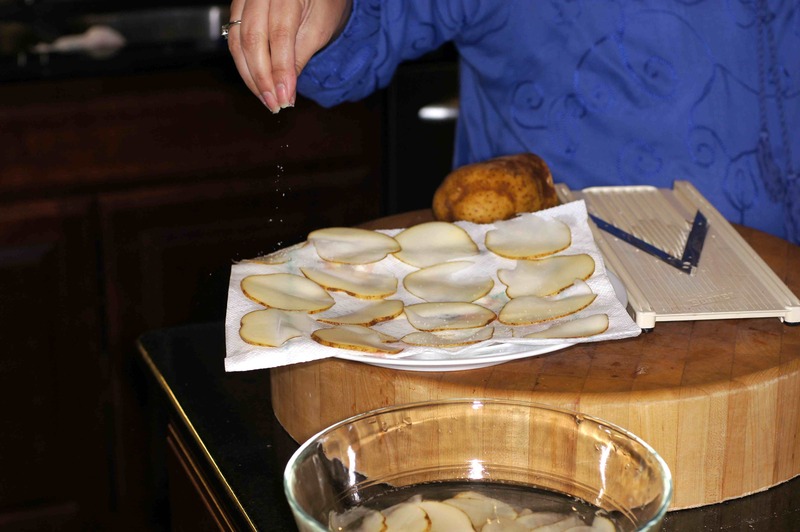 I stopped buying potato chips ages ago but this recipe could be the end of my fast. And they come with built-in portion control. I spud and that’s that. Thank you both. Hi, John. Baby Lady says to tell you she’s delighted to have brought potato chips back into your life. You can even flavor these however you would like. I ate 2 this morning and they are still crisp. I am completely amazed. I need to grab a potato and try this soon! I don’t know if my guy would believe me (when I say) these are fat free and tasty, but you probably just revolutionized our snacking!!! This is just one of those “you gotta try it to believe it” things. 😉 They really are good. Let me know what you think when you give it a try. 15 minutes ago, I started to read this blog. Two batches of these incredible chips later, I’m back, and absolutely amazed!. This is why people should have a microwave oven. The only improvement I’d make would be to forgo the plate and just line the glass turntable in the microwave. One less thing to deal with, and I can get more chips per batch! OMg this is genuis!! Thank you so much! I’m addicted!! I have a question though. I’ve tried them twice once with the paper towel underneath the chips and once without and both times the chips stuck to the towel and the plate am i missing sth? When we made the second batch with Yukon gold potatoes, as opposed to russets, we had the same problem. What type of potato were you using? The problem’s the starch. Change your water at least twice before putting the slices down. Then use a paper towel to blog the remaining water off the slices before you salt. You’ll greatly reduce the problem. Yukons rock by the way. I solved this problem by changing the water at least twice to remove as much of the starch as I could before putting down the slices, Before salting, I blotted the slices with paper towels. Yukons rock by the way. We change the water until it is clear (at least twice, sometimes 3 – 4 times). We actually prefer the russets to the Yukon gold in this dish which was a surprise inasmuch as we generally prefer the yukon gold in most applications. I made these today, Richard. Just had to see how they cook in a microwave. Amazing! I’m not too dextrous, so I got rid of my mandoline. I used a Rival slicing appliance instead, but it cut them 1/8″ thick. They cooked perfectly, the slightly thicken ones requiring 8½ minutes, but they did just fine. Thanks, my husband and I really liked these! I had a few in my second batch stick to the paper towel, so I switched to parchment and that worked better for me. Sign me up, for those that like this idea! These were very good. I am having a hard time getting them crispy though.. Any thoughts? Baby Lady and I are somewhat surprised because we never really have a difficult time getting them crispy. 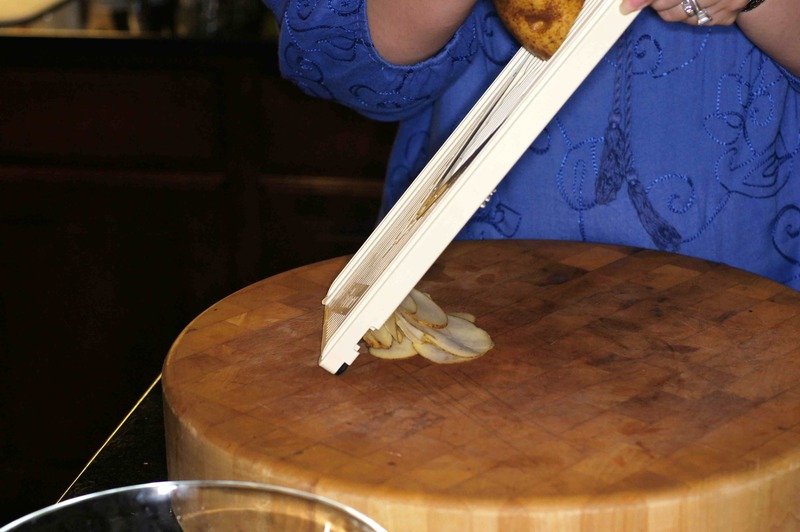 Are you slicing them 1/8 inch thick? They are very thin and you can almost see through them. Do you dry them prior to putting them in the microwave? That may help. Salting them prior to cooking in the microwave also helps because the salt helps draw out the water. Have you tried increasing the cooking time? The chips will actually brown in the microwave while cooking. We can’t think of anything else. Let us know if you are still having problems and we will see what we can do. I’m on Weight Watchers. Do you about how many points these are and the serving size.